Diet tea consists of Lini seeds, Ononidis radix root, Equiseti herba, Sambuci flos, Melissae folium and Foeniculi fructus. Lan contains mucus and ballast substances that act laxatively, regulate and facilitate the discharge of the intestines. Swaddling and rabbit trawling act diuretically, induce fluid secretion through urine and thus lead to cleansing of the organism. 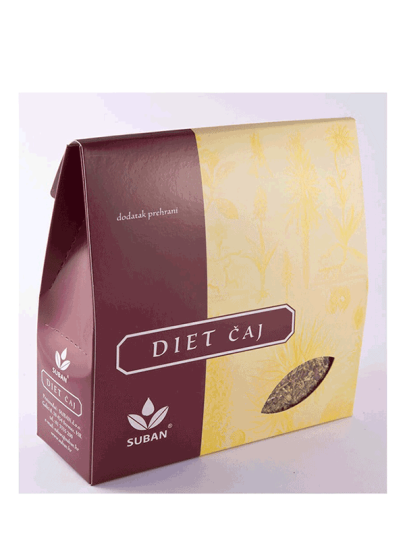 The base corrects the taste of tea and stimulates the discharge of the intestines. The grasshopper and mother-of-pearl contain essential oils that prevent and remove the overflow and work relaxing on the entire organism. Linseed (Linum usitatissimum) 25%, elder flower (Sambucus nigra) 20%, the root rabbit mandrel (Ononis spinosa) 20%, Journal of balm (Melissa officinalis) 15%, green horsetail (Equisetum arvense) 10%, fruit of fennel (Foeniculum vulgar) 10%. In 1 liter of boiling water place 2 large tablespoons (10 g) of tea mixes, leave for 20 minutes with occasional stirring, drain. Tea is repeated several times during the day, before and between meals.